On Tuesday night Andrew, Akeal and I went to the SSSI YP event titled “Environmental Initiatives Through Spatial Innovation”, which was held at the Scitech Science and Discovery Centre – specifically in the Horizon Planetarium theatre. 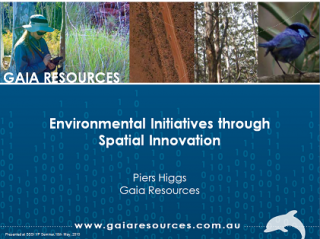 The South West Australia Ecoregion Iniative project we’ve been working on, where we have been helping to develop a systematic conservation plan for the south-west of Western Australia. I then finished up with a few slides about how we are trying to be “green” through our operations, and indicated a few ways we are trying to do things differently. In any case, the handouts are attached below as a PDF (get them by clicking on the image). The next two presenters were Tom Schut and Richard Weller. Tom is one of the lecturers at Curtin University’s Spatial Sciences Department. Tom gave an excellent presentation about the remote sensing work he’s been doing as part of his role at the Climate Change Refugia Research Group over at Curtin University. Richard gave an excerpt of his work in the Landscape Architecture area at UWA, where he has recently released an interesting book about the future of Perth, called “Boomtown 2050”. Both of these presentations really god me thinking about what we do and how we do it, and we’ll post more about how this will affect out work in the future. At the end of the talks we got a quick tour of the Universe thanks to Carly at the Horizon Planetarium. Carly has a great job, running the shows at the Planetarium. She gave the three of us a quick behind the scenes tour before the whole thing started, and showed us the banks of PCs and rack units she has in place. That was pretty cool – but not as cool as the actual show. Starting on the Earth, we went out to the known limits of observation of our universe and then back in again, and I spent a lot of time going “woooah” (a la Keanu – http://www.youtube.com/watch?v=OT4B-NJUcZE). The final thing we talked about at the event with people was that we want to start an environmental GIS group where we can get together and discuss this stuff more regularly. If you’re interested, let us know and we’ll see what we can get started – contact either myself or Tom to register your interest. We had drinks afterwards in the Scitech climate change exhibit, and caught up with a few colleagues there (in between playing with the exhibits). All in all it was a great night – I got a lot out of the other two talks, and enjoyed the event and the location a lot. So I think we’ll be going to a couple more of those in the future – hope to see you there! Contact me directly or follow me on Twitter.